/What is trending in your Loudoun Landscape? What is trending in your Loudoun Landscape? Edible Gardening: By far, the hottest new trend in landscape design is edible gardening. As people become more concerned with the quality of their fresh produce we are seeing a surge in the planting of fruit trees and herbs and vegetables. These plants are incorporated into the existing landscape, and not sectioned off in a traditional vegetable garden. The easiest way to achieve this practical and pretty landscape design is to plant fresh herbs in outdoor pots and place then around your deck or patio. Vegetables can also be planted in pots, or alongside traditional perennials and annuals in your Leesburg or Purcellville backyard. Fruit Trees, such as, orange and berries and apples make a lovely addition to traditional Boxwoods and Oak Trees. Naturalistic Gardening: This organic and thoughtful approach to gardening helps the dwindling Honey Bee population (read more about Honey Bees and how to populate them into your Loudoun Landscape here) and the plight of the Monarch Butterfly. For instance, Milkweed is the sole food for Monarch larvae. The focus of Naturalistic Gardening is to purposefully and thoughtfully plant native flowers, trees and shrubs, which keeps the insect population in a healthy balance within The Loudoun County Landscape. 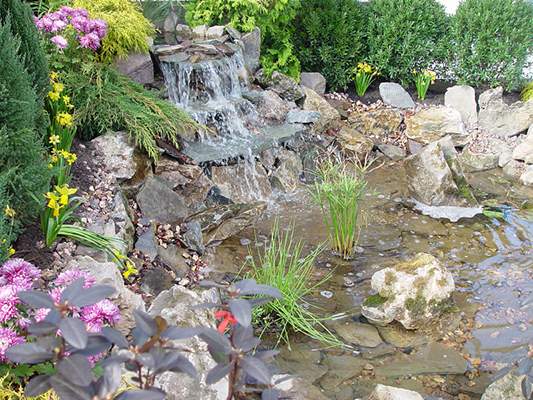 Water Features: Whether it is a wall fountain or a full on waterfall and pond water features are all the rage in landscape design in Loudoun County. Not only do they provide the soothing sounds of water but they also bring the birds and the bees and the butterflies, which is good for the environment of Northern Virginia. Property Services Landscape have been designing and constructing water features for decades in Purcellville, Leesburg, Sterling, Ashburn and surrounding towns. Contact Property Services Landscape for a free estimate here. Bring the Outdoors Inside: The focus of today’s Landscape Design is to expand your indoor living space into your outdoors by incorporating hardscapes into your backyard Think wide French Doors opening to a brick patio with a built in outdoor grill, beer tap, wine refrigerator and granite counter tops and do your cooking in your Loudoun Yard this summer. And with today’s new fabrics for outdoor furniture that are waterproof, mold resistant and easy to launder you can make a comfortable and colorful lounging area for your family and friends. Firepits: A stone or metal firepit is the ultimate landscape focal point and gathering place in your Loudoun Landscape. Not only is it a great place to gather around with your family and friends but a well-designed firepit will extend your outdoor time well into the fall and early spring. Property Services Landscape offers a wide range of design ideas for a custom firepit in your Hillsborough or Aldie Landscape. French Drains: Rather than trying to hide irrigation like drain pipes and sump pumps consider installing a French Drain to elegantly deal with water drainage. Your Landscape Design is your key to enjoying an outdoor life full of sun and butterflies and entertainment, and at Property Services Landscape of Leesburg Virginia we are here to help you do just that. Call owner and operator Brian Wedemeyer for a free consultation on a landscape renovation for your home today!